We’ve all done it, you come home from the grocery store and blindly toss everything in your fridge without rhyme or reason. Expired food and containers are pushed back or obscured by the new groceries, some of which have already expired. Some will expire soon – and simply won’t be seen in enough time to eat before spoiling. It’s hard to avoid in our busy lives, but there are ways to keep your fridge clean – and weed out the expired food without throwing it all away. There are also ways of helping the food in your refrigerator last longer. All it takes is a realistic system and perhaps a few upgrades. The professionals at RestoPros want to help you rethink your food storage in the new year. Take a few minutes to look over these simple ways to prevent food from spoiling. This is a problem many homeowners have experienced, and one that is easy to overlook. Make sure your refrigerator and freezer are set to the correct temperature. To avoid bacteria growth, you’ll need to set your freezer to 0 degrees Fahrenheit, and refrigerator to 38 degrees Fahrenheit (max). If the food in your refrigerator tends to spoil quickly, make sure to check (and reset if needed) both thermometers. Every item placed in the refrigerator should have a specific designated area. Be consistent with where you place meat and fresh produce, this will help in easily locating food that will expire soon. Showcase the containers that will expire soon by creating a rotation system where newer items goes in the back, older ones in the front. Milk and dairy products belong on the top shelves toward the back since they need to be the coldest, and your crisper bins are for fruits and vegetables separately. In these bins you can often control the humidity levels (veggies should have higher humidity than fruits). All foods are not created equal. Many have specific storage needs that, if addressed, will keep them fresh longer. For example: When you bring bananas home, you should pull them apart to slow down the ripening process. Keep them isolated from other foods on your counter. Plus, they can be used for cooking even when they are brown. Another example would be your apples: You should be checking apples daily to remove any that are starting to spoil. Meat cuts that are not going to be eaten within a few days should be placed in the freezer. Containers of soup, bouillon or other packaged liquid food that is not refrigerated should be placed in the fridge after opening. Remove anything that has spoiled, and clean up the spot where it was sitting. Even if the food didn’t leave a mess, it can leave bacteria behind which can spread to the rest of your food. Always wipe down an area where food has spoiled. 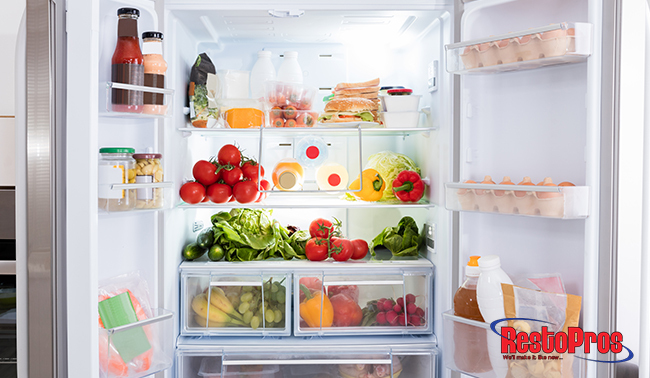 A clean fridge will help greatly with keeping food fresh longer. Power outages are usually not preventable. We recommend getting a back-up generator in case of a power outage to prevent food from spoiling. This is especially important if you keep an extra freezer of food. Back-up generators can be automatic or manual. Unless you’re using your generator for life-support or monitoring machines, you probably don’t need a heavy-duty generator. A manual one would be a great choice. We can all understand the frustration of heading to the refrigerator for a snack or to prepare a meal only to find that the ingredients have gone bad. These easy steps on ways to prevent food from spoiling can prolong the life of your groceries and help maximize your shopping budget. At RestoPros we are happy to help with any issue related to mold. If you are having a problem with mold in your home, give us a call at 855-587-3786 today! Don’t let mold take hold in the new year!